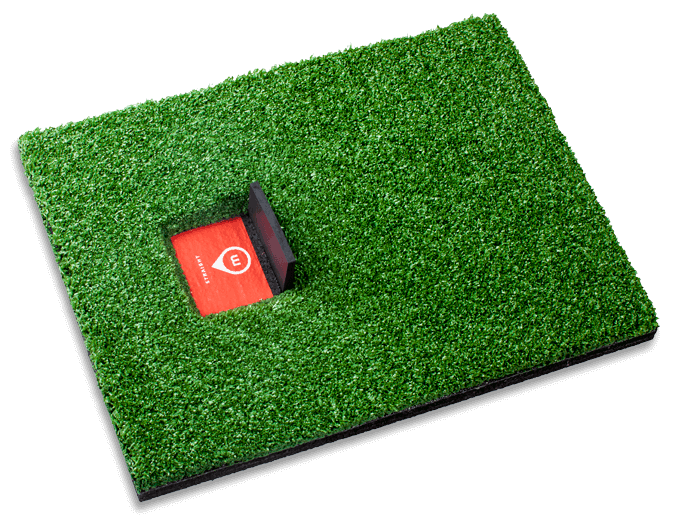 Zerogolf is a revolutionary method that enables you to quickly and permanently improve your golf game. Imagine a completely new method that enables you to quickly and permanently improve your game. That method is Zero Golf. Set your Zero correctly. These arise from players’ tendency to scoop the ball from underneath. This completely basic and ingrained stereotypical movement leads to the typical mistakes which plague all golfers. Because of this they lose control over their shots. A misplayed shot where the club comes into contact with the ground before the ball. With this kind of strike the divot may fly further than the ball! 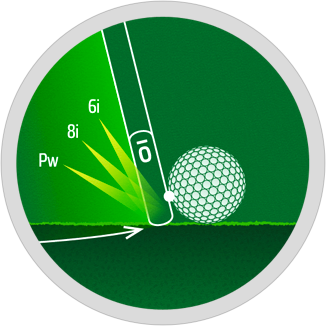 A misplayed shot where the bottom edge of the club strikes the top of the ball. These shots are low and in the short game around the green are far too long. Set your Zero correctly so that you hit the ball cleanly and the quality of your strokes will not deteriorate under pressure. In a clean shot the head of the club strikes the ball in a downward motion towards the ground. This is hard to visualize with a classic golf club but with the Zero clubface it is much easier to comprehend. Thanks to the shaped grip you’ll learn to feel Zero in every club. Every golf club has a strike plane the same as a tennis racket or a table tennis bat. 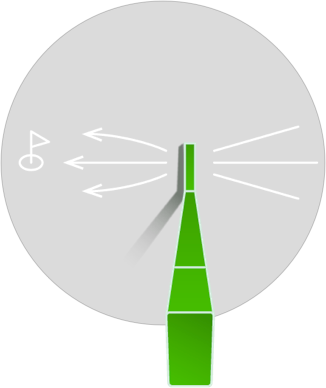 It’s direction determines the rotation it gives to the ball. Because the classic clubs have round grips the player can not feel the direction of the clubface plane and so is not able to make use of it. This is the reason why your balls do not fly in the direction you were expecting and you seem to have almost no control over them. Important sense channels which the brain uses and which play a crucial role in learning are sight, touch and hearing. Thanks to the Zero set you can better develop and exploit the potential of your senses. The set teaches you how to make a clean strike and a straight-flying shot. 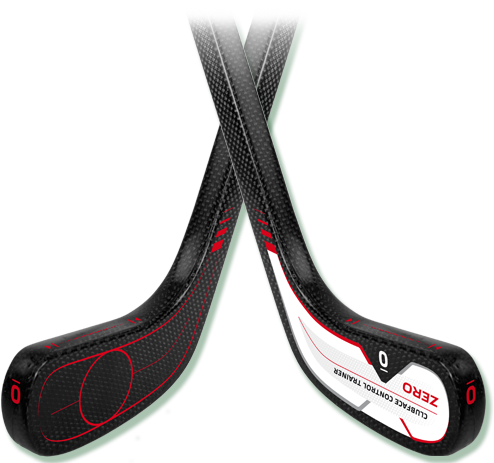 Thanks to the Zero set you will continue to increase accuracy of your strike and improve your club control throughout the swing. 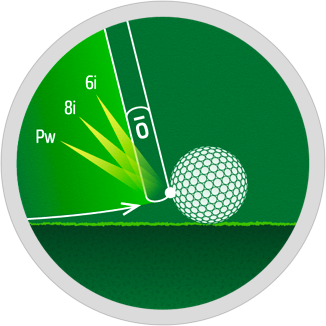 The Zero set helps to clarify the basic principles of the golf shot, to create clear understanding of how to play the ball and to learn the correct movement pattern. 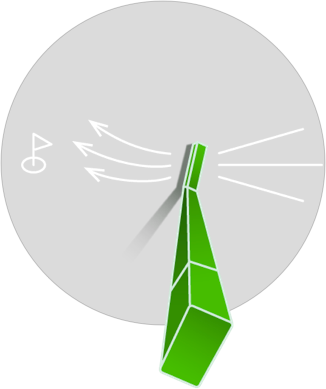 Only if you learn the movement correctly you will be able to reproduce it under pressure in the real game. 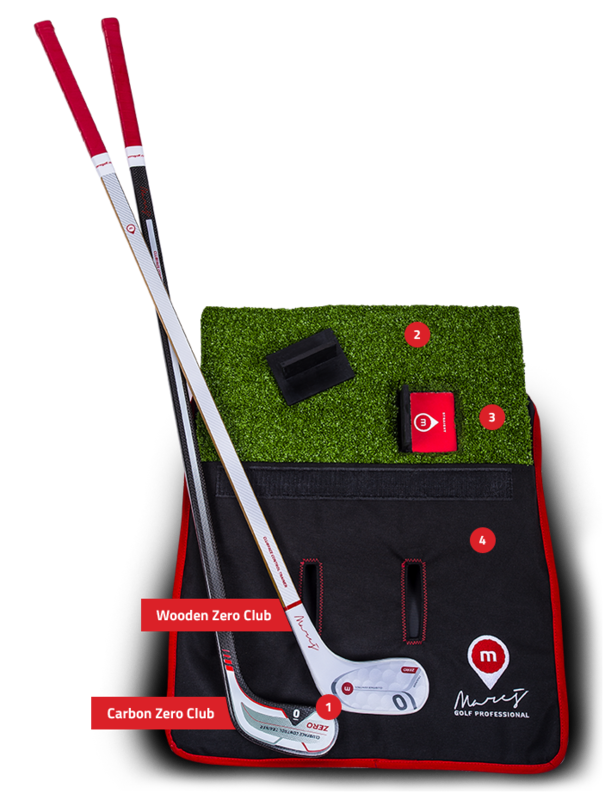 The Zero Set makes the whole process of learning golf simple, fast and transparent. The Zero club is the only club designed to help you feel the plane of the clubface. Unlike classic golf clubs, it has a rectangular grip and zero loft (i.e. 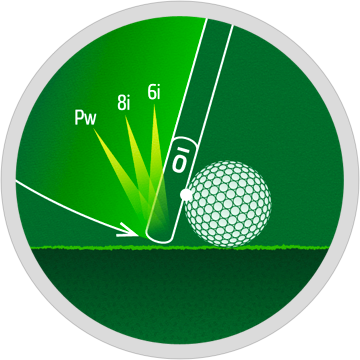 the clubface is in line with the shaft). Learning is accelerated through involving several senses – you can see the plane of the clubface and, at the same time, feel it. The aim of training with the Zero club is to develop a conscious ability to control the ball flight. Exclusive carbon version of Zero club is in elegant black color. Carbon is modern durable material, thanks to which Zero club is practically indestructible.  Compared to wooden Zero club, "Carbon" version will widen the unique training allowing full swing with classical ball. The club is weighted as a classical golf club #7.Hand made in small batches. Czech patent. Atractive and original gift for all golf enthusiasts. 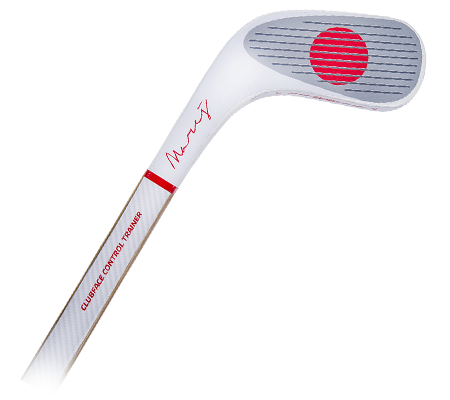 The Wooden Zero Golf club is hand made using "hockey stick" technology but with the parameters of a 7 iron golf club. You may use it either as a part of the Zero Golf Set (Zero Mat and Zero Tee) or for chipping with a standard golf ball, but not using a full swing. These work together with the Zero club in unison to help you practice your shots. 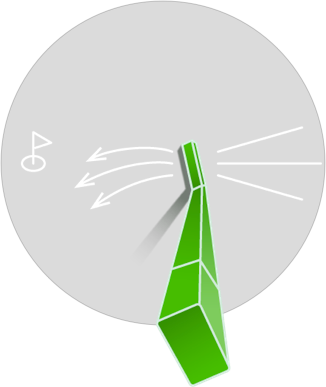 Thanks to the characteristic “slap” sound of the zero loft clubface hitting the flat tee the player gets an instant feedback on quality of the shot and, as a result, is then able to adapt and improve the next shot. This can shorten the learning time and further improve the swing technique. Take advantage of your handy Zero Golf mobile phone app. It will track each hit, record your swing history and show your training progress, while keeping you motivated! How does the Zero set work in practice? Pay online using your PayPal account or your card. to arrange shipping and payment. If the problem remains order the products via e-mail or phone. Improve your game under the expert supervision of the qualified coach, Otakar Mareš. 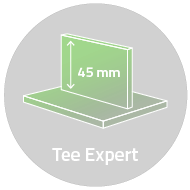 Thanks to the Zero Golf training programme and special training aids your shot will improve significantly in just a few lessons.